I am the source of all spiritual and material worlds. Everything emanates from Me. The wise who know this perfectly engage in My devotional service and worship Me with all their hearts. "From Narayana, Brahma is born, and from Narayana, the patriarchs are also born. From Narayana, Indra is born, from Narayana the eight Vasus are born, from Narayana the eleven Rudras are born, from Narayana the twelve Adityas are born." "In the beginning of the creation there was only the Supreme Personality Narayana. There was no Brahma, no Siva, no fire, no moon, no stars in the sky, no sun. There was only Krishna, who creates all and enjoys all." In the many Puranas it is said that Lord Siva was born from the highest, the Supreme Lord Krishna, and the Vedas say that it is the Supreme Lord, the creator of Brahma and Siva, who is to be worshiped. In the Moksa-dharma Krishna also says, prajapatim ca rudram capy aham eva srjami vai tau hi mam na vijanito mama maya-vimohitau. "The patriarchs, Siva and others are created by Me, though they do not know that they are created by Me because they are deluded by My illusory energy." In the Varaha Purana it is also said, narayanah paro devas tasmaj jatas caturmukhah tasmad rudro 'bhavad devah sa ca sarva-jnatam gatah. "Narayana is the Supreme Personality of Godhead, and from Him Brahma was born, from whom Siva was born." Lord Krishna is the source of all generations, and He is called the most efficient cause of everything. He says that because "everything is born of Me, I am the original source of all. Everything is under Me; no one is above Me." 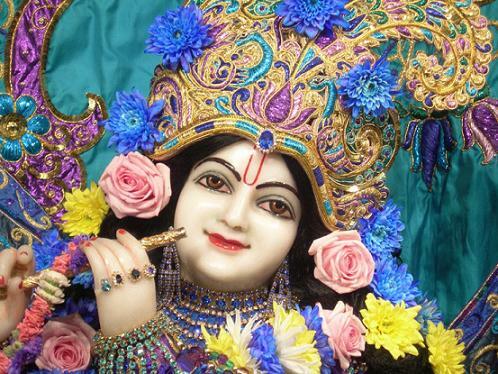 There is no supreme controller other than Krishna. One who understands Krishna in such a way from a bona fide spiritual master and from Vedic literature, who engages all his energy in Krishna consciousness, becomes a truly learned man. In comparison to him, all others, who do not know Krishna properly, are but fools. Only a fool would consider Krishna to be an ordinary man. A Krishna conscious person should not be bewildered by fools; he should avoid all unauthorized commentaries and interpretations on Bhagavad-gita and proceed in Krishna consciousness with determination and firmness.